make your PC like a phone! 2/4/2016 3/6/2016 by tom moody Comments Off on make your PC like a phone! 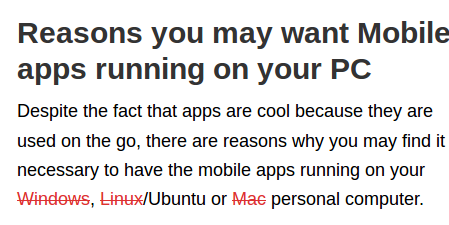 Why not just use a smartphone emulator on your desktop? http://www.emoretech.com/best-android-emulators-windows-mac-os-x-linux-free-download/ That way you can participate in the "majority's experience." Here's another example, Ed Halter's squib on the so-called "Rematerialization of Art," from 2008, which touched off some extensive commenting by yours truly and others. Ironically, this page can be viewed correctly on the Wayback Machine at https://web.archive.org/web/20080517165715/http://rhizome.org/editorial/fp/blog.php/590 but on Rhizome Halter's text has gone missing. The comments are there but they make little sense without showing what they are reacting to. The same thing happened four years ago when Rhizome did a top-to-bottom site overhaul. Eventually most of the problems were identified and fixed, just in time for the current site overhaul, where everything was broken again. It's obvious where the $600,000 needs to be spent. Update: The content of the Halter post has been restored. Next post in need of rescuscitation: http://rhizome.org/editorial/2008/apr/08/brush-off/ (also missing text by Halter).